Concerto #5 in A Major, K. 219 "Turkish"
Summary for the Busy Executive: Eye-opening. I admit to a certain amount of crankiness toward Mozart. Sure, he wrote masterpieces, but on the whole I wouldn't leave the house to hear most of his work. For some strange reason, Haydn appeals to me far more – quirkier, more surprising. Mozart is so finished that listening to his music often reminds me of a ride in a big old Rolls – very comfortable, but not very interesting. As I say, I realize most music-lovers think otherwise, and I admit I've dropped my share of solecisms on the topic of Mozart's music. The violin concerti, with the exception of the fifth and its exciting "Turkish" finale, seemed just to waste my time. Then I heard a live Hilary Hahn and the Cleveland conducted by Jahja Ling in the third, and the scales began to loosen from my eyes. This wasn't merely one of the great Mozart performances, but one of the milestone concert experiences of my life. The concerto matched Hahn's elegant, sweetly lyrical playing, and the Cleveland proved an ideal accompanist. This was Szell's ideal of orchestral music as "chamber music, only with more instruments" realized. It seemed as if every player lavished the same care on the subtlety of line as the soloist. I began to come around to the thought that it probably wasn't coincidence that my favorite Mozart works I invariably heard first from great performers. God knows I'd heard the third often enough, from many different soloists, both known and not-so-well-known. How did Hahn differ? Mainly, she knows how to sing. There aren't a lot of notes for the soloist, and so each note has to count. In this sense, the Mozart concerti prove more difficult than the Tchaikovsky. Hahn showed me that the melodies weren't boring, but beautiful, and she seemed to sense exactly why. I'd love to hear her do the whole set. To some extent, Hahn won me over because she presented a view of the concerti very similar to my own – elegant entertainment rather than heaven-storming or heroic or Romantically desperate. Again, the concerti suit her tone and her approach. But what about somebody not Hilary Hahn, someone like Mela Tenenbaum? Tenenbaum's "violin personality" has a lot more grit and tartness. I associate her with the two Shostakovich concerti, not because I've ever heard her do them, but because she has the steel, the nerve, the insight, and the sense of drama. In a certain way, she's "wrong" for Mozart, just as Isaac Stern is. Yet Stern's recording with Szell and the Cleveland of the Mozart fifth remains, surprisingly, one of his best, despite how much he may have hated working with Szell. 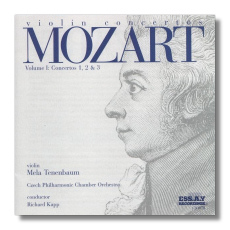 Stern gave the concerto something more than mere suavity and politesse, and Mozart benefited. Tenenbaum doesn't deny her own nature in serving Mozart. The tone is slightly less big than usual, in concession to the classical idiom, but this is a psychologically rich, adult reading. She gets "inside" the notes, turning them into music that matters, not just to Mozartolators or to historians, but to who we are now. It's an intimate reading, in the sense that she draws us in very close, as well as a "home-made" one. She doesn't resort to assembly-line Interpretation with a capital I. She's obviously thought about every phrase, yet she sounds as if she has made everything up on the spot. I never realized the peculiarity, the unpredictability of Mozart's invention here until Tenenbaum and conductor Richard Kapp made me appreciate it. Listen, for example, to the unexpected delay in the first half cadence of the opening movement of the second concerto or to the riddle of the placement of the first full period in the opening movement to the third. As a result of the Tenenbaum-Kapp account, I began to try Ernst Toch's exercise of listening to a cadential period of a concerto movement and then trying to guess the general substance of the bars to the next period. I reacted like Toch: in every case, Mozart was sharper, unhackneyed, and always threw in a little surprise, God knows where from. And yet it seemed so natural, so inevitable in context – maybe that's why it flew over my head. Basically, this recording taught me to listen harder. 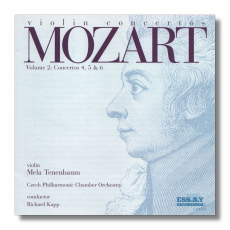 Mozart's violin concerti may be a step away from the pleasantries of the galante style, but what a step! I stress the individuality of this reading. Nobody walks on eggshells. Nobody tries to sprinkle scented wig powder over these scores. Tenenbaum and Kapp avoid the sentimentally genteel. Like Hahn, Tenenbaum knows how to get the violin to sing in her own way, but she does sing. Her control over a range of color and dynamic astonishes me. Mozart may repeat riffs, but Tenenbaum never does them the same way twice. She is always in the groove of the phrase, which makes her crescendos and decrescendos seamless and undistorted. For me, the slow movements stand out – absolutely glorious and free of the clichés of Mozart andante playing: the feeling that you've wandered into Miz Wingfield's glass menagerie. These tracks have given me the most pleasure, and that's not to slight the fast movements. Tenenbaum makes the composer sound not only elegant and entertaining, but wise. The second CD includes the so-called sixth concerto. From the day it appeared, in the early nineteenth century, people have doubted its authenticity. Nevertheless, the liner notes assert this was the most popular of the collection during the century. Frankly, it sounds to me like Mozart composed it just after somebody beat him stupid. I miss the incredible control over the symmetry and asymmetry of phrases, the bizarre surprises that appear in the authenticated five. Some scholars claim that some themes might come from Mozart. But usually Mozart's themes are the least of his work. However, what he does with them makes the piece. Since everyone's speculating, I might as well stick my oar in. It seems likely to me that Mozart's widow persuaded somebody in her circle to dish up a Genuwine Mozart, perhaps from scraps left behind, so that she could make a little money. Something a bit like that happened with the Requiem after all. She tried to minimize the contributions of Eybler and Süssmayr in her marketing efforts for the piece. At any rate, including this concerto does Mozart no good at all. I love the music-making from everybody concerned on the disc – heimisch in the best sense. Everybody seems to play as if they enjoy each other's company – the pleasures of minds in consort. It's not mechanical, driven, lockstepped, or even whipped into shape. It's a conversation that grows before us. I've heard Grumiaux's, Szeryng's, and Suk's sets, and, as far as I'm concerned, Tenenbaum and Kapp yield nothing.